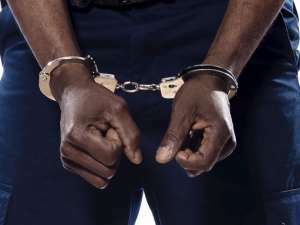 The Kwahu– Mpreaso District Police Command in the Eastern Region, has arrested Daniel Kofi Bamfo, a 28-year-old man for allegedly stabbing Kwame Danso, a 35-year-old farmer to death over pork. The incident, it would be recalled, occurred at Biretwum, a suburb of Ntomem in the Kwahu South District on 1st March 2019. The suspect as gathered killed Kwame Danso. That was after the suspect who was selling pork, had accused the deceased of spreading fake news about his business which affected his sales. Due to that, the suspect who became infuriated visited the deceased’s house to demand accountability for causing him financial loss. In the process, it turned into an argument, leading the suspect to allegedly stab the victim. The victim was rushed to the hospital but was pronounced dead later. The Mpreaso District Police Commander, DSP Francis Oppong, who confirmed the the arrest, said the late Danso’s wife reported to the police that, the suspect came to their house and engaged the husband in a fierce fight. According to DSP Oppong, in the process of fighting, she noted that her husband was stabbed and was rushed to Kwahu Government hospital at Atibie for treatment. DSP Oppong continued that after taking the complaint and whiles the police were preparing to follow up to the hospital to authenticate the information, the said suspect Daniel Kofi Bamfo also came with a wound on him claiming Kwame Danso inflicted those wounds on him.